Noisy Scrub-birds have had a chequered history. Originally they occurred over a large part of far SW Western Australia, almost as far north as Perth but they gradually disappeared to the extent that they were thought to be extinct. Then in December 1961 an astute birdwatcher, Harley Webster, in dense coastal heath just east of Albany, sighted a single bird. 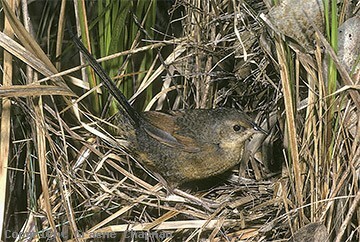 From then on it has become one of the most famous rare birds in Australia. Soon after the discovery the Two Peoples Bay Nature Reserve was established to help preserve the species, a declaration that made the news because it involved moving the site of a proposed new township! Since that time, Noisy Scrub-birds have been the subject of much attention - they are one of the most sought-after rare birds in Australia and also the subject of several different research projects. Attempts to ensure their future by translocating birds away from the Two Peoples Bay reserve have met with mixed success - wildfire is the main problem. 356203 ... 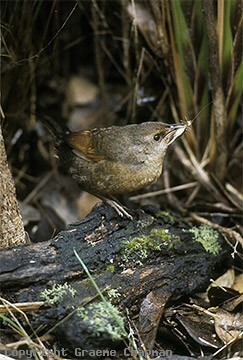 Noisy Scrub-bird, female at nest, Two Peoples Bay, W.A.